New Delhi : Marvel Tea's new TVC, starring Kareena Kapoor Khan has been shot in London, across some of the most iconic landmarks, such as Trafalgar Square Fountain, St. James Park, and Tower Bridge. The TVC begins with the actress sipping a piping hot cup of Marvel Tea, looking refreshed and vibrant. Every spot presented in the TVC holds a special meaning as she walks by herself, smiling and smelling the flowers, enjoying her time alone. The shots are interspersed with the process of a cup of Marvel Yellow Tea being prepared. Commenting on the new campaign, R.C. Jain, chairman and managing director of Marvel Group, said, "Marvel Tea is known as one of India's top five brands. We thought of having a celebrity for our campaign who is as royal as Marvel Tea. I believe that no one can match up to Kareena's royal and beautiful look and hence we decided to launch our new campaign with the beautiful and talented actor." Speaking about the association with Marvel Tea, Kareena, Brand Ambassador, said, "I am privileged to associate with Marvel Tea, as they have always focused on providing a product which exceeds in quality and taste. The brand association with Marvel Tea is very special, as it offers a taste than is unparalleled, which is why it has made a rightful place in the Indian beverage market. I am truly excited and look forward to a long association with Marvel Tea." R.C. Jain further added, "This campaign is a true amalgamation of two very important personalities i.e. Marvel Tea and Kareena Kapoor Khan. 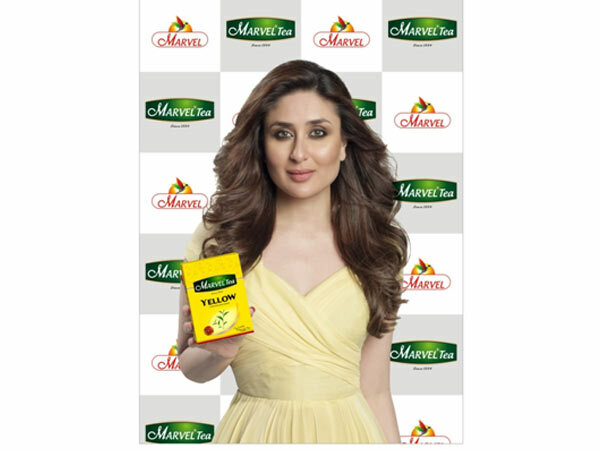 With "Har Lamha Naya ho jaye" campaign we want to entice the audience with the great taste of Marvel Tea-Yellow. Apart from a 45 second television commercial, viewers on the digital platform will get to watch a making of the film which will be exclusive to social media and will go live soon." The campaign is created by a team of globally acknowledged creative minds, including Mick Coulter, the Director of Photography who is Oscar-nominated and has previously worked on Hollywood movies like Sense and Sensibility, Notting Hill and Love Actually.